We are to love one another genuinely and deeply. We can only do this when we have pure hearts. 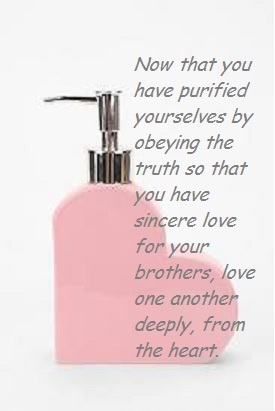 Has your heart been washed with truth? Another beautiful devotion and prayer for us to take to Him, Patricia! Thank you! Is it not wonderful that though we need daily washing now someday we will be pure and perfect creatures. One sin washed away, another one comes up. Can our heart be truly pure?